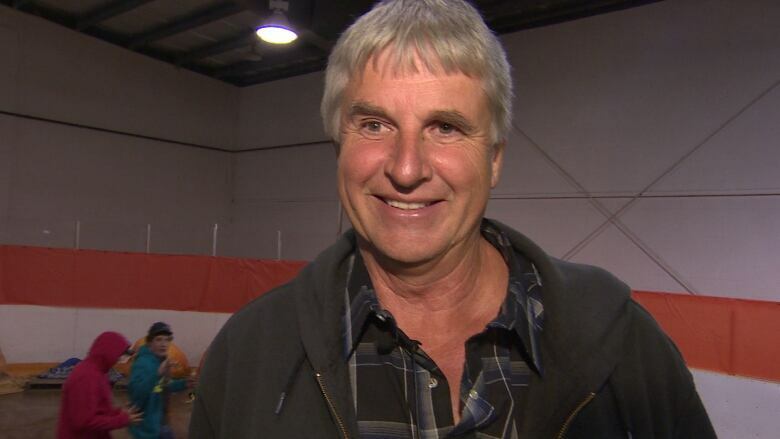 Brought in by forklift and flanked by volunteers in orange overalls, Raymond Beaudin's record-breaking pumpkin was the talk of the town in Smoky Lake this weekend. It took thousands of dollars and months of effort to get Raymond Beaudin on stage with his pride-and-joy. But when he finally got to stand up, balanced on the top of a prize-winning pumpkin and bathed in the light of dozens of smartphone cameras — well, that made it worth all the work. "It's a hobby. Or an obsession. Depends how you look at it," said the Coalhurst-based pumpkin grower. Beaudin's gigantic gourd took the top prize at this year's Great White North Pumpkin Fair in Smoky Lake. Weighing in at 1470.5-lbs, it smashed the previous Alberta record by nearly 200 lbs —which Beaudin also held. People take their pumpkins pretty seriously in Smoky Lake, which has held the festival for 27 years. The event started as a friendly wager between two brothers, according to festival president Pat Palechuk. It grew from small weigh-offs in the town's curling rink to a busy two-day festival. Raymond Beaudin says the even started as a side hobby and is now "an obsession." (Travic McEwan/CBC)The competition breeds a certain amount of secrecy among the growers. Palechuk says the night before the weigh in, pumpkins are watched over by security officers. Most growers are reluctant to discuss their methods for getting their squash to expand. But there are rumours. Palechuk has heard everything from injecting them with milk to using birth control pills to encourage them to grow, among other ideas. "They sometimes have music. The pumpkins love music, that's how they make them grow," she said. Beaudin offered a few glimpses into how he got his pumpkin to record size. The first step is a solid heritage: the seed for the gourd came from a record-holding 2323.7-lb. Swiss pumpkin, pollinated by a 1495-pounder from the United States. From there, he feeds it a steady diet of humic acid and fish. Beaudin estimates this year's pumpkin cost about $380 a month in electricity costs alone. It's a far cry from the 12-lb. pumpkin he grew in his first year. "It's just a challenge. To see if you can get better and better as you go," he said. "I didn't start off getting competitive, but it has kind of gotten that way. The more of these guys I get to know, the more I want to beat them." Beaudin estimates that over the years his pumpkins have been able to raise a total of $60,000 for charity through various events.